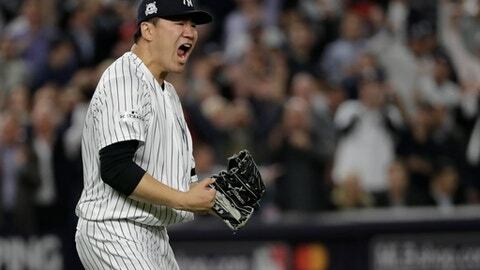 TAMPA, Fla. (AP) Masahiro Tanaka went with his heart when deciding not to opt out of the final three seasons of his $155 million, seven-year contract signed in January 2014 with the New York Yankees. ”We went into battle with these guys, last year especially,” Tanaka said Wednesday through a translator after a bullpen session at the Yankees’ minor league complex. New York came within one game of reaching the World Series last season, losing in Game 7 of the ALCS to Houston. It turns out if Tanaka would have decided for free agency last fall, the right-hander might have found himself trapped in a slow-moving market with few big deals being completed a week from the start of spring training. ”You want to be here or you want to be wherever and get ready for the season,” Tanaka said. Tanaka is 52-28 in 105 starts with the Yankees. He allowed 35 homers – up from 22 in 2016 – last year, but finished 13-12 over 30 starts. ”At the start of the season, it was really shaky,” Tanaka said. ”I felt like I was making adjustments, adjustments and adjustments throughout the season. Tanaka is a little disappointed that two-way Japanese star Shohei Ohtani signed with the Los Angeles Angels this offseason and not the Yankees. ”A player of that caliber, you want to be on the same team,” Tanaka said. The Yankees did add NL MVP Giancarlo Stanton in a trade with Miami. ”Honestly, I was excited to hear about the news,” Tanaka said. Tanaka has not talked yet with new manager Aaron Boone, who is making his managerial debut this year following the firing of Joe Girardi. Yankees pitchers and catchers report for spring training Tuesday.